April 12, 2016, 9:30 AM · Congratulations to the Junior Finalists, announced Tuesday, in the Menuhin Competition in London! Yesong Sophie Lee, 12, U.S.
Click here to listen to their performances, and the other rounds of the Menuhin Competition. 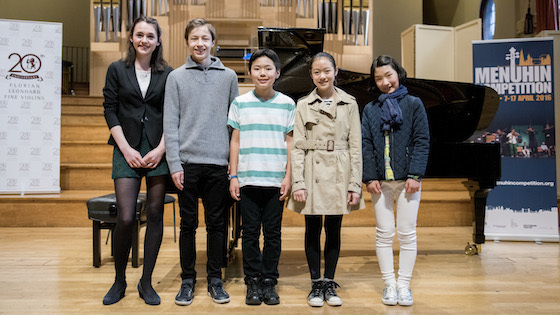 Junior Finalists in the 2016 Menuhin Competition. Finals for the Junior Division (under 16) will take place Friday at the Royal Academy of Music. Each finalist will lead the Yehudi Menuhin School Orchestra in one of Vivaldi’s Four Seasons. They will also perform the world premiere of "Shpigl" by Òscar Colomina i Bosch, commissioned for the competition.